Thank you for taking the time to learn more about my professional background. I have been licensed as a chiropractor since 1985 and was trained at the National College of Chiropractic, now the National University of Health Sciences in Lombard, Illinois. At National I received my Doctor of Chiropractic degree and a Bachelor of Science in Human Anatomy. 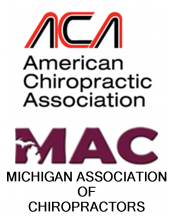 Additionally, I am board certified by the National Board of Chiropractic Examiners and the Michigan Board of Chiropractic and a member of both the American Chiropractic Association and Michigan Association of Chiropractors. Prior to attending chiropractic college I received a Bachelor of Science in Biology / Psychology from the University of Michigan in Ann Arbor. My professional focus is in the area of multidisciplinary, integrative and conservative spine care. My training has included attendance at CME (continuing medical education) symposia, including conferences sponsored by Cleveland Clinic Center for Spine Health and Henry Ford Hospital. My practice focus is on the clinical management of patients with neuro-musculoskeletal conditions, particularly those affecting the spine. My expertise is in helping patients prevent and manage spine related pain and improve wellness without the need for drugs and surgery. I work with some of today’s most common, troublesome, and in many cases disabling health concerns such as back pain, neck pain, headache, sciatica, and conditions like neuralgias or “pinched nerves”, spinal joint problems, disc disorders and muscular pain syndromes. I provide patient evaluations, ortho-neuro assessments, motion palpation and static palpation examination, McKenzie mechanical diagnosis and therapy, hands on spinal adjustments, manipulations, mobilizations and other forms of manual therapy. Other procedures that I have an expertise include flexion distraction / spinal disc decompression (Cox), myofascial release and trigger point massage therapies. My special interests include back fitness / rehab exercise, and spine hygiene education, teaching back care concepts, posture, body mechanics, ergonomic / occupational factors, core strengthening, neutral spine / dynamic stabilization, McKenzie exercise, safe lifting technique, and injury prevention programming. In practice my goal is to provide evidence informed and patient centered care. I follow research based clinical guidelines and standards that have been set forth by the National Committee for Quality Assurance – Back Pain Recognition Project. For those who may be new to chiropractic care – I am happy to report that the trend is toward increased acceptance of our services. This has resulted as those suffering with spine related problems, physicians and other health care providers learn more about our protocols, consult us, begin to feel their best and appreciate the benefits, safety, comfort and effectiveness associated with our care. Consult us. We’re here to help.